Magnesium chloride is a supplemental form of the mineral magnesium, which you rely on for the maintenance of several important body functions. Your doctor may recommend use of this supplement if you have a magnesium deficiency or if you experience a heart attack. Specific recommended dosages vary with the type of condition under treatment. Your heart, kidneys and other organs, as well as your muscles, all rely on magnesium for their normal day-to-day function. It plays an essential role in a wide variety of chemical reactions, helps regulate your blood pressure and blood glucose levels, and also helps your body regulate its levels of other vital nutrients such as vitamin D, calcium, potassium, zinc and copper. Foods with significant magnesium content include nuts, tofu, leafy greens, whole grains, legumes, blackstrap molasses and wheat bran. Other forms of supplemental magnesium include magnesium gluconate, magnesium lactate and magnesium citrate. While many Americans don't get enough magnesium to meet current recommendations, clinical deficiencies of this mineral rarely occur, according to the University of Maryland Medical Center. However, a variety of medical conditions can trigger short- or long-term magnesium deficiencies, including intestinal viruses that trigger diarrhea or vomiting, diabetes, kidney disease, chronic gastrointestinal diseases, an overactive thyroid gland and an inflammation of the pancreas called pancreatitis. In your heart, magnesium contributes to the maintenance of normal cardiac rhythm. People who regularly drink "hard" or alkaline water, which has a relatively high magnesium content, appear to have lower risks for fatal heart disease than those who regularly drink "soft " water. If you have a relatively mild magnesium deficiency, your doctor may prescribe a single daily dose of an oral medication that combines 535 mg of magnesium chloride with 64 mg of pure, elemental magnesium, Drugs.com reports. If you have a severe magnesium deficiency, your doctor may prescribe an intravenous, or IV, solution that delivers 4 g of magnesium chloride over a period of roughly three hours. If you have a heart attack, also called a myocardial infarction, within the first day of your attack your doctor may give you an IV dose that contains 1 g of magnesium chloride. Other heart-related ailments commonly treated with some form of supplemental magnesium include irregular heartbeat and congestive heart failure. Nonheart-related ailments sometimes treated with magnesium supplements include diabetes, asthma, fibromyalgia, high blood pressure and pregnancy-related blood pressure problems called preeclampsia and eclampsia. 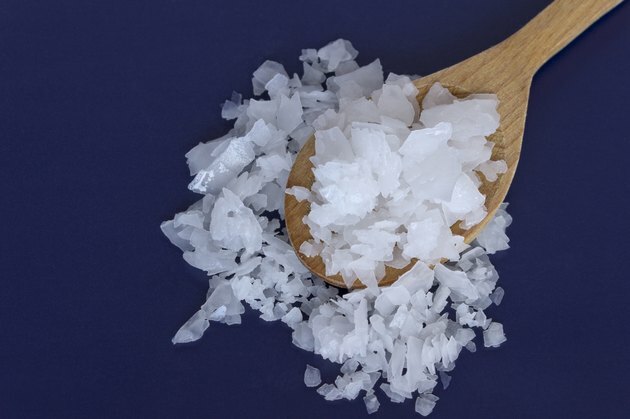 Drugs that can potentially alter the effectiveness of magnesium chloride include antibiotics, digoxin, thyroid replacement medications, certain osteoporosis medications, amphetamines used for ADHD treatment and sodium polystyrene sulfonate. Review your medication usage with your doctor before you use or receive a magnesium chloride product.